Back in the '50s, there was a wrestling company in Argentina that was becoming very popular ('catch-as-catch-can' style, like today's WWE), and it was called “Titanes en el Ring” ("Titans on the mat"). 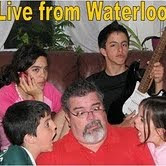 In the beginning, the shows would take place at the same places where boxing matches took place; years later, with the advent of TV, the show became very popular with the kids, and the TV version was especially aimed to them. In the 70's, when I was a little kid, the Titanes were at the peak of their popularity. Not only they had the TV show and the special events at the boxing stadiums, they also shot a couple of movies, they toured around the country and they had all kinds of merchandising. For example, there were some small chocolates called "Jack" that came with a surprise inside, and there was a whole "Titanes" collection. Me and my brothers had many of those miniatures, but they were all scattered around and we were missing many already, so we would usually play with our cousins, because they had theirs all organized and well taken care of. The "Titanes" world was very different from what you see on shows like WWE today. For starters, even though there were 'good guys' and 'bad guys' ('faces' and 'heels', in today's terms), the bad guys weren't that bad. They would usually cheat to win, but that was it. The one hour long show would fit five or six fights, and the good guys would normally win. In the event of two good guys fighting each other, it was highly probable that the match would end in a draw. Another thing that was very different was that there was only one title, and the champion was always the same guy: the creator of the show, Martín Karadagián. Karadagián was well in his fifties or sixties already by the time I was watching the show, but he would still manage to defend his title with no major problems. He was short and had an incipient belly, but he could still take guys twice his size down with the aid of two extremely powerful weapons: the 'cortito' ('short one'), which was a hit done with the forearm, and the 'quebradora' ('back breaker') that would literally brake his opponents in half. OK, maybe not so literally... Even us kids couldn't believe that Martín was invincible, but it was still fun to watch the show. The fighters would represent many things. There were regional champions, like the 'el ancho' ('the wide') Rubén Peucelle (champion of Argentina), José Luis (champion of Spain) or Guipúzcoa (champion of the Basque province); others were based on historical or Biblical characters, like Don Quixote, Julius Caesar, David the Shepherd, Genghis Khan or Attila (these last two were 'bad guys', of course); another group was those whose names were linked to commercial products, like the insanely popular Yolanka (a yogurt brand), Gran Pan (a brand of bread), STP the car driver or later on Dink C (it was an orange juice); many shared the fact that they were coming from a specific place in the world, like the Comanche chief, Ulus the mongol, Kanghai the mongol, Sun the Korean, Chicho from Catanzaro, the Prince of Napoli o el Ivanoff the gypsy. There was a clown, Pepino (who lived near my place and was a regular at Gaby's pasta store) and a superhero, the Caballero Rojo (the Red Knight). These last two were very popular, especially the last one. 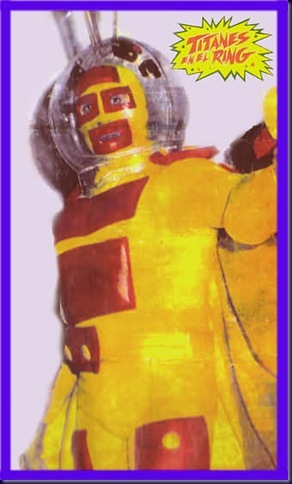 Both me and my brother Guilllermo were Caballero's fans, who never showed an explanaton or superpower that would justify the title of 'superhero'. He wore a mask, and the legend says that he was kept his real identity almost a total secret until he passed away in 2007. “The Mummy... the deaf and mute wrestler... he is stronger than steel..."
“He protects good people... punishes the bad ones!!! And he loves children... very tenderly... THE MUMMY IS AN AVENGING ANGEL!!!" Oh, then the Mummy was a good guy! Phew! He was so popular, that he even beat Karadagián a few times (non-title matches) and in the end, he went on to challenge him for the gold at the end of a season; the fight was at the Ferrocarril Oeste indoor stadium that was absolutely packed. There, in a very unusual fight, a Karadagián all covered in blood barely retained against the Mummy, all thanks to the fact that he found a weak point at the very last moment: a specific spot in the Mummy's back that, when hit, would cause him to go into a series of spasms that you would think the Mummy had a short circuit. Even then, Karadagián didn't win, but the fight ended in a draw. Another consequence of the Mummy's popularity was the appearance of another one, called The black Mummy. This Mummy was a bad one, and it wore boxing gloves (!!!). An absolutely ridiculous concept. They even went on to think about creating a Pink Mummy and a Kid Mummy but thankfully those plans were scrapped. Interestingly, the black Mummy had a very lively, you would even say happy, entrance song than his 'good' counterpart. The referees were also important characters on their own: you had Professor Davis and the Count Schiaffino, who were good referees (though Davis turned in the last seasons); there was another guy named Giardina, who wanted to be bad but was too inept to be successful, and then my favourite: the extremely bad, meanest among the mean William Boo, a big guy who would always favour the bad wrestlers and was always looking for ways to steal the victories from the good guys. 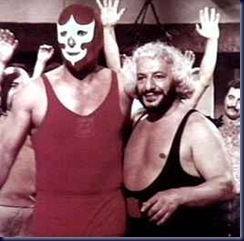 I always remember how good we was at playing dumb when a bad guy was being pinned, while the play-by-play guy (Carlos Di Sarli) yelled: "Señor Boo! Count, señor Boo!!!" One day, the Titanes tour made a stop in Necochea and I went with my father and my two brothers to watch them at the Rivadavia Club indoor arena. The main event was extremely attractive: both Mummies pitted against each other! Very excited, we watched all the other fights with interest (there were many more in the live events, because they didn't have the one-hour constraint), but we were all waiting for the last one. Even Karadagián fought before them that day. Black Mummy's happy tune sounded and in he came, lying on an open casket carried by four guys. Then, after waiting forever, the lights went down and I didn't even think about it: I jumped to go and hug my hero. - Mummy, is it true that you're deaf and mute? I could not believe my ears. The Mummy had confirmed the information himself! I rushed back to tell Guillermo and my dad, who laughed out loud. I couldn't understand why. In the meantime, the much anticipated match had begun, and it didn't last long: a few minutes into it, the black Mummy flew over the ropes and landed hard on top of the very casket they had used to bring him in. He laid there, very hurt, for a while, until they eventually put him back in the casket and carried him away (!!!!). Many kids were either scared or concerned, but not me: I was still excited about having confirmed that the White Mummy was deaf and mute. He had told me so. 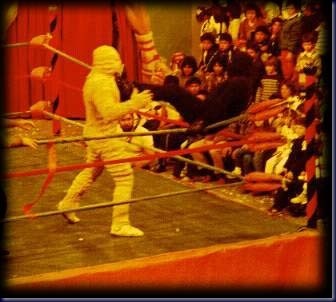 Here is a fight between Karadagian and the Mummy, from the "Titanes" movie. Aquí hay una pelea entre Karadagián y la Momia, de la película de los "Titanes". No estoy seguro de si es 'la' pelea, porque no veo sangre... Oh, no era. Está aquí. Note: Two days after I wrote this story (in Spanish), I found out that William Boo (the mean referee) had died in total poverty. I will always remember him as one of those people that I loved so much to hate. A character like his in WWE would be a tremendous success today. Allá por la década del 50, comenzó a hacerse popular un programa de lucha tipo ‘catch’ (al estilo de WWE) que en Argentina se llamaba “Titanes en el Ring”. Al principio, los espectáculos se montaban en los mismos estadios en los que había combates de box; años después comenzó a emitirse por televisión, lo que lo hizo muy popular entre los chicos, ya que la versión televisiva estaba especialmente orientada a ellos. En los años ’70, cuando yo era chiquito, los Titanes estaban en el pico de su popularidad. No sólo tenían el programa de televisión y los eventos especiales en los estadios de box, sino que además tenían películas, giras por el interior y toda clase de merchandising. Por ejemplo, los chocolatines Jack venían con sorpresa, y había una colección que eran los Titanes en el Ring. Yo los coleccionaba con mis hermanos, pero siempre los teníamos desparramados y nos faltaban muchos, así que por lo general jugábamos con los de mis primos, que tenían todo guardados como corresponde. 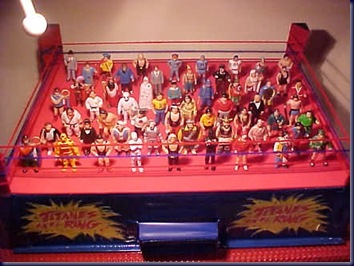 El mundo de los Titanes en el Ring era bien diferente de lo que se ve hoy en día en programas como WWE. Para empezar, si bien había ‘buenos’ y ‘malos’, los ‘malos’ no lo eran tanto. Más de una vez ganaban haciendo trampa, pero eso era todo. El programa de una hora contenía cinco o seis peleas, y por lo general siempre ganaba el ‘bueno’. Y si daba la casualidad de que pelearan dos ‘buenos’ entre sí, era muy probable que todo terminara en empate. Otra cosa que lo diferenciaba de los programas de ahora es que había un solo título, y el campeón fue siempre el mismo: el fundador del programa, Martín Karadagián. Karadagián ya estaba grande para la época en la que yo miraba el programa, pero sin embargo se las arreglaba para defender su título sin problemas. Era petisito y medio barrigón, pero así y todo era capaz de derribar luchadores del doble de su tamaño utilizando dos poderosísimas armas: el ‘cortito’, un golpe dado con el antebrazo que dejaba a sus adversarios completamente turulos, y la toma quebradora, que los partía literalmente en dos. Bueno, no tan literalmente… Ni siquiera los chicos nos creíamos que Martín fuera invencible, pero así y todo era divertido mirar el programa. Los luchadores representaban muchas cosas. 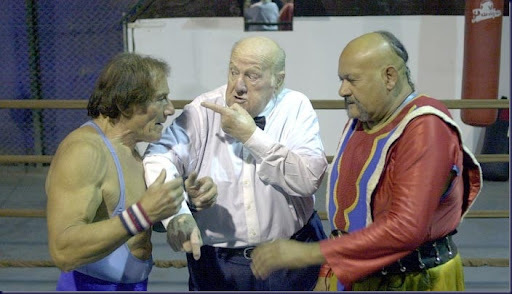 Habían campeones regionales, como ‘el ancho’ Rubén Peucelle (campeón argentino), José Luis (campeón español) o Guipúzcoa (campeón vasco); otros estaban basados en personajes históricos o bíblicos, como Don Quijote, Julio César, David el Pastor, Genghis Khan o Atila (por supuesto, estos dos últimos eran ‘malos’); otro grupo lo integraban los que estaban ligados a productos comerciales como Yolanka (marca de yogurt), el panadero Gran Pan, el piloto tuerca STP (marca de lubricante para autos) o más adelante, Dink C (un jugo de naranjas); había varios que tenían como toda característica venir de un determinado lugar, como el indio Comanche, Ulus el mongol, Kanghai el mongol, el coreano Sun, Chicho de Catanzaro, el Príncipe di Napoli o el gitano Ivanoff. Había un payaso, Pepino (que terminó siendo cliente del negocio de Gaby), y un superhéroe, el Caballero Rojo. Estos dos eran popularísimos con los chicos, en especial el último. Tanto Guillermo como yo éramos fanáticos del Caballero Rojo, quien nunca había dado ninguna explicación o mostrado superpoder alguno que justificara su título de ‘superhéroe’. La leyenda indica que fue el único de los luchadores que mantuvo su verdadera identidad casi en el anonimato, hasta que falleció en 2007. Ah, claro, la Momia era buena! Menos mal! Su popularidad fue tan grande, que llegó a ganarle a Karadagián algunas veces (el título no estaba en juego) y por fin disputarle el campeonato a final de la temporada, en un estadio de Ferrocarril Oeste que pocas veces había visto tanta gente. Allí, en algo para nada común en esa época, un Karadagián bañado en sangre apenas retuvo el título frente a la Momia, gracias a que encontró a último momento su único punto débil: un lugar específico en su espalda, el que al ser golpeado le causaba un ataque a la Momia que uno juraría que estaba en cortocircuito. Así y todo, Karadagián no ganó, sino que la pelea terminó en empate. Otra consecuencia de la popularidad de la Momia fue que al año siguiente apareció otra, llamada la Momia Negra. Esta era mala, y usaba guantes de boxeo. Una ridiculez total. Incluso, se llegó a especular con una Momia Rosa y un niño Momia, pero por suerte esto no llegó muy lejos. La música de la Momia Negra era mucho más alegre y divertida que la de la Momia Blanca, sin embargo. Los referís también eran personajes: estaban el Profesor Davis y el Conde Schiaffino, que eran referís buenos; también estaba un tal Giardina, que quería ser malo pero no le salía; y después, mi favorito: el malísimo William Boo, un hombre grande y gordo, que siempre favorecía a los malos y buscaba formas de robarle a los buenos sus triunfos. Siempre me acuerdo de cómo se hacía el distraído cuando un malo estaba con la espalda en el piso, mientras el relator (Carlos Di Sarli) le gritaba: “Señor Boo! La cuenta, señor Boo!!!”. Un día los Titanes en el Ring llegaron a Necochea y fuimos junto a mis hermanos al Piso de Deportes del Club Rivadavia a verlos. El evento principal no podría ser mas atrayente: las dos momias se enfrentaban entre sí! Entusiasmados, miramos todas las demás peleas (eran bastante más que cuando estaban en la tele), pero todos esperábamos el plato principal. Hasta Karadagián peleó antes esa vez. Sonó la música alegre de la Momia Negra y allí entró, dentro de un féretro abierto, al que llevaban cuatro hombres en sus hombros. Y al final, después de tanto esperar, las luces se apagaron y yo ni lo pensé: me largué para abajo para abrazar a mi ídolo a su entrada. - Momia, es verdad que sos sordomuda? Yo no podía creerlo. La Momia en persona me lo había confirmado! Salí corriendo a contárselo a Guillermo y mi papá, que se murieron de la risa. Y yo no entendía por qué. Mientras tanto, la esperada contienda entre las dos Momias había comenzado, y no duró mucho: a los pocos minutos, la Momia Negra voló por encima de la tercera cuerda y cayó afuera, con tan mala suerte que lo hizo encima del mismo féretro en que la habían traído. El luchador quedó muy lastimado en el piso, y curiosamente lo introdujeron en el cajón y se lo llevaron. Muchos chicos se asustaron, pero no yo: todavía me duraba la emoción de que la Momia Blanca me hubiera confirmado que sí era sorda y muda. De su propia boca. Nota: Cosas del destino, a los dos días que terminé esta historia, me enteré por el diario de que William Boo (el referí malo) había muerto. Lo recordaré como uno de los personajes de mi infancia que más me gustó odiar. Un personaje como él en el WWE de hoy sería un éxito tremendo. "Caballero, Caballero Rojo, es intrépido y leal, es valiente y es genial, Caballero Rojo, Caballero Rojo, Caballero, Caballero Rojo, paladín de la verdad, defensor de la razón, Caballero Rojo, Caballero Rojo, El Honor de vencer es su premio, combatir como un gran caballero, la verdad, la justicia es su sueño, y en la lucha es ser siempre el primero".Que grande Titanes!! Ay! Hasta yo a los 4 años tenía una remera (t-shirt) del Caballero Rojo! y mi hermana una de la Momia.Ya lo había olvidado...Gracias por los recuerdos! Que lindo volver a recordar esas epocas. Mi primo y yo eramos fanaticos y recuerdo que con gusto nos bañabamos y poniamos el pijama para ver titanes en el ring, luego mesa de noticias y despues a la cama. Grande Gabriel...Impresionante lo de los Titanes... muy buen post.Son muchos los recuerdos que uno tiene de esa época.Me acuerdo perfectamente de la pelea de Karadagian vs. La Momia y como festejé el empate. Es que uno se enganchaba, aunque sabía que todo era un show.Te informo que los chocolatines Jack todavía existen. Seguro que La Momia le gana al Undertaker... Hace poco fallecio Pepino el payaso... una pena que van quedando pocos. Te acordas cuando rompimos el vidrio del depto despues de una toma? Pucha... tuve toda la intención de hacer un post cuando me enteré lo de Pepino y lo dejé pasar...Ando muy haragán con lo de armar un par de posts...Trataré de corregirlo, pero se me pasó hacer lo de Pepino cuando me enteré. Te entiendo, Mike, a mí me pasa igual, por eso últimamente he escrito algunos post en 'ráfagas'. Por ejemplo, anoche escribí el WW de hoy, el post de esta tarde y los dos de mañana. Claro que me fui a dormir como a las 3:30 y tres horas después estaba arriba...Pero todo sea para seguir dándole de que hablar al imbécil de Kanata. Me agarraste totalmente desprevenida con lo del dialogo de la momia, estoy en el trabajo tentada de la risa, no puedo parar, espero que no venga ningun alumno a hablarme! Andaaaa... que me vas a ganar!!! Si el que hacia las patadas voladoras en el mar era yo!!! y Cua Cua Patona era mejor! Cua-Cua Patona y El haragan... IDOLOS! Como me gustaban!! sobre todo Raúl Peuchele y la momia. No me perdía ningún capitulo. Por suerte duró para que lo disfrutara mi hijo mas grande, a él le encantaba "el hombre vegetal" creo que Caradagian ya no estaba. Si asi es Ale, Ruben Peuchele el maximo titan y la momia!!! aunque preferia a la momia.Que bueno todavia me acuerdo del album de figuritas. Verguenza?No, para nada... es un soplo de aire fresco.Uno mas.